Isn’t that a fabulous quote from Helen Keller? In the case of crafting why not push the limits…take a chance…try a new technique…try different colors…stretch your creativity! This awesome sketch comes from Holly McMillen over at Splitcoast. A fabulous sketch that could work for so many different cards. I’ve used a masculine theme here but it would work just as easily with florals, or perhaps a Christmas theme. I’ve used a standard A2 card base, followed by a layer of designer paper. Next comes a couple of 2″ x 2 1/2″ rectangles that I’ve stamped. The wide strip of coordinating designer paper across the bottom of the card is 5 1/2″ x 1 1/2″ and that’s been topped with a 5 1/2″ x 3/4″ strip of card stock that’s also been stamped. I’ve added a couple of brads as embellies and then layered two pieces of card stock popped up on dimensionals. I used another little stamp from this set on the topmost circle. Every layer has been distressed with the exception of the circles. Two of the stamps from this set were used to create the matching envelope, one stamped in Not Quite Navy and then the other stamped over top in Early Espresso. 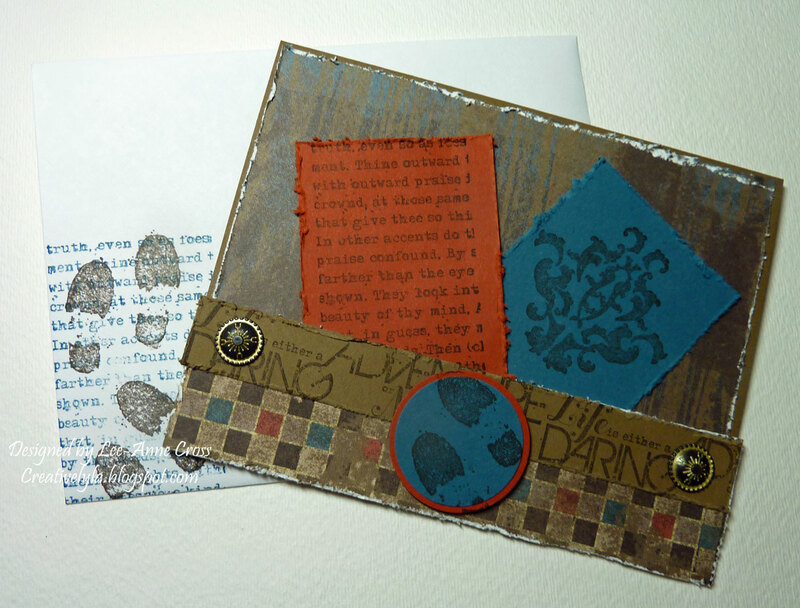 Accessories: Stampin’ Up 1 3/8″ Circle Punch, 1 1/4″ Circle Punch, Cutter Kit (distressing tool), Antique Brads, an A2 envelope and dimensionals. Hope you’re having a wonderful Sunday, everyone!